Dr. Michael A. Bruno has been passionately serving the Lake County, Illinois community for over 25 years. He is happily married to his wife Cindy Bruno and has 2 children...Chris and Carrie Bruno. Take a moment to read about his background and feel free to contact us with any questions. Doctor Bruno graduated from the College of Lake County with an associate of science degree in 1982. He attended Palmer College of Chiropractic in 1985 with courses of Study For A Doctor Of Chiropractic Focus on Anatomy, Physiology, Chemistry, Neurology, Orthopedics, and various other Health and Biological Sciences. In addition, his Chiropractic Training includes an internship in which he assists in caring for patients in a clinical setting, under the direct supervision of licensed Doctors of Chiropractic. 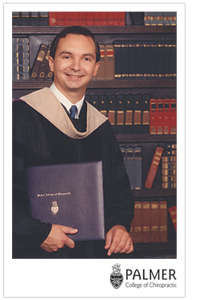 Doctor Bruno graduated as a "Gold Coat Graduate" of Palmer in 1985. Palmer College of Chiropractic is known as one of the best Chiropractic schools in the country and is considered The Trusted Leader in Chiropractic Education. Palmer is the first and largest chiropractic college in the world and is accredited by the Council on Chiropractic Education and the Higher Learning Commission of the North Central Association. After graduating from Palmer Dr. Bruno was fortunate enough to work in Aurora for Erickson Chiropractic from 1986 - 1987. Bruno Chiropractic was formed in 1987 after purchasing Dr. Cullen's practice in Waukegan, Illinois. 25 years have passed and Doctor Bruno still offers compassionate bedside manner and treats everyone of his patients like “One of the Family.” As a Gold Coat graduate of Palmer College of Chiropractic, Dr. Bruno utilizes the “Palmer Approach” of 100% pure “Hands-On” for spinal and extremity adjusting (shoulders, elbows, wrists, etc.) This approach and our technique is specifically designed and administered to relieve any current health problems you might have and to prevent any health problems that may develop due to a misalignment of spinal segments or what we call (subluxations) in chiropractic. When you come to Bruno Chiropractic, most patients want one thing. RELIEF. For this reason it's our first priority to achieve the fastest most effective pain relief. Most of the time we are able to achieve this after the first few visits. Usually, we will work with you for two weeks, between 5-6 visits. Under most circumstances we will see considerable improvement in that time period. The sooner we get the results you want the sooner we can taper your care down. I'm very proud of the fact that when patients come to see us they know exactly what is going on, there are no surprises or long-term commitments. "I treat my patients like I would treat my mother or my grandmother." "In Accordance With The Law Of Nature, That Law Which God Has Prescribed To All Men: And In Consequence Of My Dedication To Getting The Sick Well By The Application Of That Law, I Promise And Swear To Keep, To The Best Of My Ability And Judgment, The Following Oath: I Will Observe And Practice Every Acknowledged Rule Of Professional Conduct In Relation With My Profession, My Patient, My Colleague, And Myself. I Will Keep An Open Mind Regarding The Progress Of My Profession, Provided That These Progressions Shall Be Confined Within The Boundaries Of The Chiropractic Science, Philosophy, And Art. I Will Serve My Patient To The Best Of Ability, Violating Neither His Confidences Nor His Dignity, And In My Associations With Patients I Shall Not Violate That Which Is Moral And Right. I Shall Improve My Knowledge And Skill, Firm In My Resolution To Justify The Responsibility Which The Degree Of Doctor Of Chiropractic Symbolizes And Imposes. To All This, I Pledge Myself, Knowing These Ideals Are Prescribed By The Dictates Of Reason Alone."